40 of Leroy Franklin's (l.) players went on to be drafted by Major League Baseball teams. 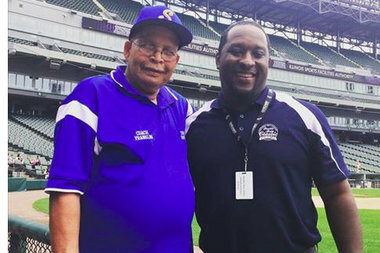 AUBURN GRESHAM — Leroy Franklin, the longtime baseball coach at Simeon Career Academy, is retiring after 35 years, school officials said. The retirement was confirmed by school athletic director Reginald Brock. Franklin's last game as Simeon's coach was a 6-2 loss to Evergreen Park High School in the 3A regional championship game. Franklin first joined Simeon as the freshman-sophomore baseball coach in 1975. Six years later, he became the varsity baseball coach. Two years later, in 1983, he won the school's first city championship in baseball. Forty of Franklin's players went on the get drafted by Major League Baseball teams. The most recent, Corey Ray, was taken as the fifth overall pick in the 2016 MLB Draft by the Milwaukee Brewers. Franklin taught physical education in the Chicago Public Schools for 34 years. Brock said a man like Franklin cannot be easily replaced. "Coach Franklin has been an important part of the Simeon baseball community. He's been a mentor, a positive role model, and a great coach," Brock said. "He's been a father figure to many of our young men. It's sad to see him go but we wish him well." Ryan Robinson, a former coach in the West Englewood Baseball League, is a former player of Franklin's. He said Franklin took him under his wing after he transferred from another high school during his senior year. "I was an academic qualifier and he made it his job to find me an athletic scholarship. I ended up at Howard University," Robinson said. "He cared more about Ryan the person than Ryan the baseball player." Robinson, who will be on the staff that is taking over for Franklin, said Franklin changed baseball on the South Side for the better. "Leroy Franklin revolutionized baseball on the South Side. He was able to collaborate with all the local youth leagues to create a steady stream of talent to Simeon," Robinson said. "No other coach has been able to foster those relationships successfully. Anybody who is anybody in Chicago baseball owes a piece of their success to Leroy Franklin." Brock said Dennis Butler Jr. will be named varsity baseball coach on an interim basis. Butler is the brother of former Jackie Robinson West coach Darold Butler. Franklin is scheduled to coach at this weekend's all-star game dubbed "Chicago vs. New York."